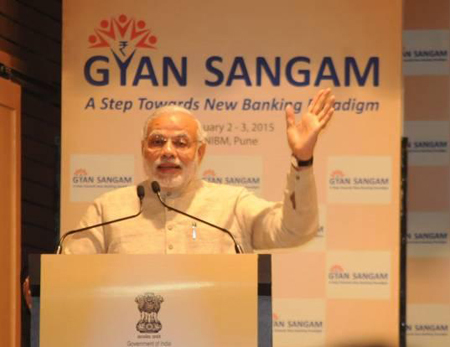 A two-day Gyan Sangam or Bankers’ Retreat was arranged by the Finance Ministry in Pune on 1st & 2nd January 2015. The interaction of ministry officials, RBI Governor and heads of PSBs in an informal setting is a novel idea. It helped in opening a healthy dialogue between the government, regulators and the banks. Apart from top executives from public sector banks (PSBs), insurance companies and financial institutions, senior Finance Ministry officials attended the meeting. Finance Minister Arun Jaitley, Minster of State Jayant Sinha and Reserve Bank of India Governor Raghuram Rajan participated in the meeting. Prime Minister, Narendra Modi also addressed the bankers and categorically promised bankers that there would be no government interference in the functioning of banks. He appreciated the efforts of the banks in successfully implementing Pradhan Mantri Jan Dhan Yojana. He called upon banks to take the lead in encouraging competitions on financial literacy in schools, much like mock Parliament competitions. The Prime Minister said banks should develop dedicated teams to fight cyber crime. The Prime Minister called for an end to lazy banking, and asked banks to take on a proactive role in helping the common man. The Prime Minister said that as part of Corporate Social Responsibility, banks should take up one sector each year to play a positive role. The Prime Minister called for developing common strengths among the 27 public sector banks. He suggested this could be done in areas such as software, and advertising. He gave the example of number portability in the telecom sector in this regard. He said this would improve the customer-centric focus of banks.